I've found a fancy pigeon……what should I do? If you find a ‘lost’ fancy pigeon and it will not fly away, please give it some food and water. Wild bird seed or brown rice will be fine, along with an old margarine tub for water. Pigeons can be contained in a cat box or dog crate or even a cardboard box with holes in for ventilation. If you have the bird contained and it has a closed ring with the prefix NPA on the ring, report it to the NPA who will trace the owner. The NPA only has records for birds with NPA on the ring. The full ring number which will be required should be similar to NPA 07 D 1352. After we have contacted the owner, they will contact you and arrange to have the pigeon collected. 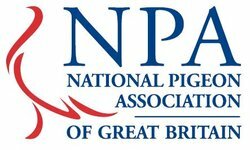 If the ring has the Prefix GB on it report it to the Royal Pigeon Racing Association as the NPA have no way of tracing the owner. Please DO NOT report birds that are NOT contained or just in the garden. Subject to availability at weekends. At other times voicemail will be available.